Editors Note: Nothing makes editors smile more than a note from one of our RE@L app users. In the tradition of helpful commentaries by previous young contributors like Sam, Josh, Ellen, and Tyler (for more, see some of our earlier blogs), RE@L learns a lot from our young users. Emma’s story below makes us happy all over, knowing that Babysitting, Inc – Get Organized helps kids start up a promising business and learn new skills that are lifelong. If there’s another young user out there with a good story, send it on! “I am really excited because tomorrow, I am going to buy a new cell phone at the mall which I worked hard to earn the money for by babysitting. To help me become a good babysitter, I’ve had many helpful resources. One of these being the Red Cross Babysitting class. I learned lots of useful information in this class. 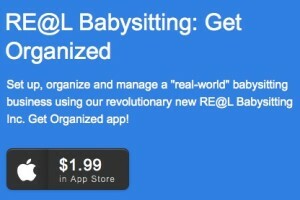 As an add on to the course, I have the “RE@L Babysitting: Get Organized” app. It is a clear, helpful tool I can reference at any time! The app helped me set up my babysitting business with many helpful ideas. The ones that I use the most include the business plan maker and the budgeting tool. The app’s business plan maker lets you select the ages of the children you want to babysit, the risks and finances of your business and more! Then, it writes up a little overview for you. This part is fun because my plan is always changing!When I first started babysitting, I had no idea about even the ages of kids I wanted to babysit, and other babysitters I knew were already talking about finances! This app helped me gather my thoughts and make them into an organized plan! Now, thanks to this tool, I have a clear goal and plan for my business. I really like the budgeting tool because I can enter all the information I want to regarding earnings and expenses. This tool then compares my profit to these two things. The budgeting piece helped me decide if I could afford to buy a new cell phone and how many baby sitting jobs I would need to earn the money. I finally decided (with the help of the RE@L babysitting app) to go for it because with lots of earnings through babysitting, I still have a significant amount of profit once I buy this. Thank you, Emma, for your own story about Babysitting, Inc. Your timing is perfect as RE@L has 60% off pricing on purchasing this app. For the rest of October, you can buy it for just $1.99. Click on the graphic here for more information!